Make the chutney In a blender, puree the yogurt with the apple, peanuts, serrano and lemon juice until smooth. Add the cilantro and pulse until just combined; season with salt. Refrigerate until ready to use. Make the frankies In a medium saucepan of salted boiling water, cook the sweet potato until tender, about 10 minutes. Drain well and pat dry with paper towels. In a large nonstick skillet, heat 1/4 cup of the oil. Add the cumin and cook over moderate heat, stirring, until fragrant, about 1 minute. Add the onion and cook, stirring occasionally, until softened, about 5 minutes. Stir in the garlic and cook until fragrant, 30 seconds. Add the mushrooms and cook, stirring occasionally, until tender and almost all of the liquid has evaporated, 8 to 10 minutes. Stir in the sweet potato, ginger, garam masala, chili powder and turmeric. Add the coconut milk and cook until hot, 2 to 3 minutes. Stir in the chopped cilantro and season with salt. Scrape the mushroom filling into a large bowl and keep warm. Clean the skillet. In a medium bowl, whisk the eggs and season with salt and pepper. In the skillet, heat 1/2 teaspoon of the oil. Arrange 1 roti in the skillet and drizzle one-sixth of the beaten egg (about 2 tablespoons) over it. Flip and cook the roti over moderate heat until the egg sets, 1 minute. Transfer to a plate and tent with foil. Repeat with the remaining oil, roti and eggs. Arrange each roti egg side up on a platter or plates and top with some of the mushroom filling. Drizzle with some of the chutney and finish with the shredded cabbage and cilantro sprigs. Roll up the roti and serve, passing more chutney on the side. 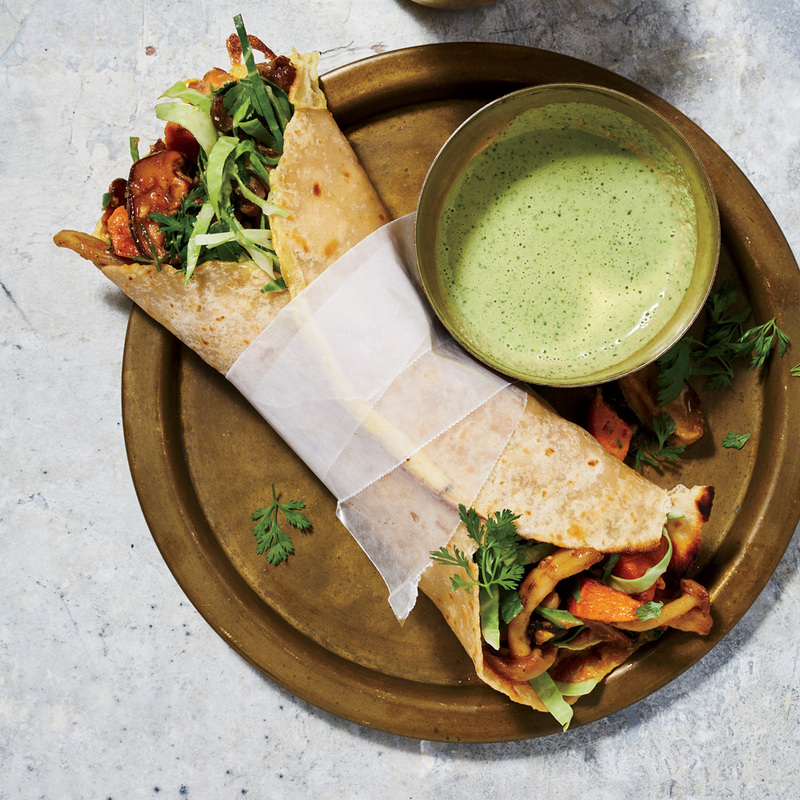 The mushroom filling and chutney can be refrigerated separately overnight. Gently reheat the filling before proceeding. Review Body: This recipe was amazing. Granted the mushrooms needed to cook much longer than anticipated (you really want to get them well browned to an almost meaty finish) the result was an extraordinary vegetarian dish that was substantial- an intense combination of flavors and textures. Furthermore, the heat of the main dish was perfectly paired with the cool chutney. Yum yum yum. Loved it- I added it to my list of repeats. Review Body: Absolutely delicious!! Made this dish using flour tortillas..The sweet potato and mushrooms blend superbly with the spices. The Aroma alone gets five stars. Highly recommend if you enjoy cooking with the family!!! Review Body: this is the first I've ever thrown out a recipe that took far too long to put together, used far too many ingredients, and was pretty much disgusting. Sweet potatoes and mushrooms did not sound good, but I thought I'd trust a chef who makes her living doing this stuff. Not good. I may be able to salvage the chutney for something, no idea what, I ended up with peanut butter and jelly on a flour tortilla.